Yes, I have it. No, I don’t know how to photograph it. Last month’s prompt from Ali Edwards’ workshop focused on capturing your word through the lens of your camera. I loved the examples that she shared about her word (which is “light”) and both the literal and figurative representations. Christmas lights, a shadow on the wall, sun streaming through a window, her running shoes (she is working on being lighter and running more lightly). Interesting, creative, authentic. As I have thought and watched and hunted for a way to capture my word over the last six weeks, I have found myself wanting something different. Something better. Something more true to what I feel faith is. I could take a photo of prayer or the church or the scriptures. All of those things certainly represent faith for me. But for some reason I have hesitated. They seem so ordinary or overdone or….something. Luckily, spring has started to show itself out the window of my home office. I love crocuses. They are the first color after the gray skies of winter. Their thin green leaves poke their way through the semi-frozen soil (and often a layer of snow) with determination. They are tiny. The first autumn after we moved in, I planted three patches of crocuses in my front yard – one patch for me to see as I drive to and fro and two patches for me to look at every time I pass the window. I gasp with delight as the first green centimeters come up and again when the flowers start to bloom. I find myself pausing to open the shutters just right so I can see them more clearly. This year, Cole is old enough to get a day-by-day exploration of the growth and it does my heart good when he points to all the new shoots saying, “Green!” I think faith is the color green. We plant something not knowing if our efforts will be rewarded but believing that something beautiful and healthy will find its way above ground. Sounds a little like life, doesn’t it? Having faith that our hard work to overcome challenges, to be kind to others, to live positively and all the other good stuff will help us rise to the surface? So, here is my first photo representing faith. I’m working on more – Cole will certainly be included in the bunch and definitely something that represents my religion. But I’m not sure how they will be captured quite yet. I might even include a photo or two from the past that I feel are a true reflection of my personal faith. Maybe some from those times in my life that I have exercised faith, trusted completely in something bigger than me and realized faith’s empowering qualities. I suppose I shouldn’t be surprised that this has become so difficult for me. Isn’t this precisely what faith is? Something intangible yet real. Invisible yet so clear when we see its reward. Something fleeting yet powerful. Faith is a belief in something. A feeling. A conviction of hope. Of course it would be difficult to translate that into something as two-dimensional as a sheet of photo paper. Here’s to capturing faith. Not only in my heart and mind but on my camera, too. I know, I know. It’s been forever since I last posted. Here’s the thing. I was busily preparing to go on vacation to Hawaii with my sister and her 21-year-old daughter. We share a birthday week – my sis is four days shy of being exactly six years older than me. I was in elementary school while my sister was in high school. She says that she was self-absorbed and she probably was. Who isn’t in high school? But I only remember her as being nice to me. Who wants to share a bedroom with their little sister? Probably no one. But I never got the impression that she didn’t want me around. We rearranged our beds in every configuration throughout the years. Mattresses on the bed frames, mattresses on the floor, pushed together, spread apart, perpendicular or parallel, if it could be done then she had us trying it. I turned 40 last week. I was born in 1971 and I am the fourth of six children – 4 boys and 2 girls. My sister and older brothers used to listen to Casey Kasum on the radio every Saturday morning while we did our chores and so I grew up loving the Eagles, Boston, Fleetwood Mac and all the other Top 40 Countdown hits that passed through the 70s. Other kids my age had no idea who those bands were but when you have older siblings to show the way, you skip over the children’s music really fast. The night before the trip I took Cole to the doctor. He had been struggling with cold symptoms for a few days and still had a fever after four days. He’s never had to take antibiotics or been very sick but before I handed him off to Grandma, I wanted to make sure that this was just a little flu or something. 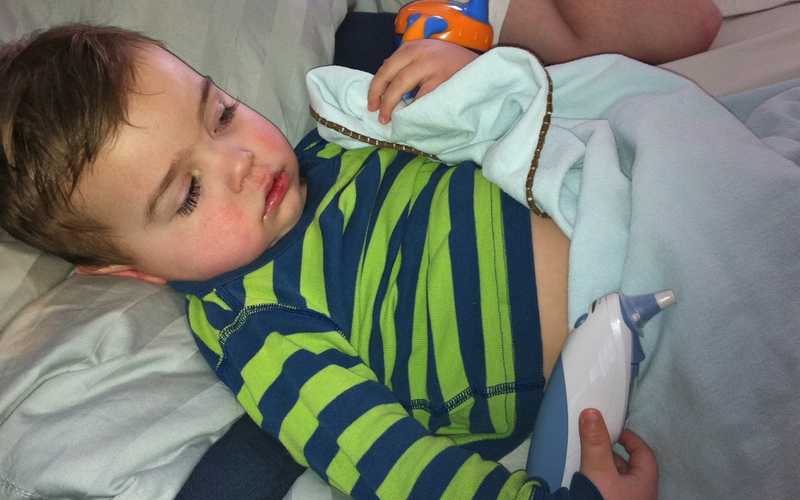 I’m sure you are guessing it correctly – he was diagnosed with RSV. Now, don’t get me wrong, I know that RSV can really be scary but I have to be honest…I wasn’t worried. I knew that he is old enough to not warrant a hospital stay. He didn’t have a history of breathing issues or asthma. It was just a matter of giving him his nebulizer treatments, his antibiotic for the secondary ear infection, and some time to let the virus run its course. He was a sick little puppy but I never worried that it would get worse or that he wouldn’t get better. Would I really have been able to relax at the side of the pool drinking Lava Flows, reading a book and basking in the sun? I know that every mother out there is thinking the same thing. It’s what we do as mothers. We give stuff up. We let things go. We take what’s left over after our children have had their fill. Motherhood is an interesting thing. I’m not saying that you have to stay home every time your child is sick. That’s just the choice that I felt was right this time. If he had been diagnosed two days earlier, I might have still gone. Because of other commitments that those watching him had, Cole was already going to have to be a multiple people’s homes during my eight-day trip. It was a little complicated to begin with. Maybe that’s why I felt like I couldn’t complicate it more by leaving him while he was sick. I know that Grandma would have taken great care of him – but I didn’t want her to be put in that position. When I analyzed the whole situation, it simply made much more sense to give this trip a pass. Yes, I was bummed. I woke up the next morning, knowing that my flight was leaving at 11:20 am, and was disappointed. I watched the clock as I bundled Cole into bed with us that morning. I noticed the time as I administered his medication. The minutes ticked by as I made breakfast. I was definitely disappointed. But, for me, I was supposed to be here. Snuggling with my little one as he asked for his nose to be wiped and held the ear thermometer like it was his long, lost friend. Cole is doing fine now. He gave both Jason and I colds, just as the doctor said he would. He woke up one morning with a grin on his face and a perky little skip in his step and we knew he was headed in the right direction. He was over all of his symptoms by the time my sister returned, tanned and refreshed, from our vacation. Yes, as I said before, I was bummed. But at the same time, I wasn’t. It was ok that I needed to take care of our little guy. It was ok that we have to reschedule Hawaii. It was ok that I didn’t get much sleep and was exhausted from the battle of trying to give him his meds. Did I like it? No. But it was ok. The sacrifice didn’t seem as much like a sacrifice as I thought it would. It was what I needed to do and it was ok. I guess that’s what it means to be a parent, right? Besides, there’s always next year. 41 is a great time to go to Hawaii.